This month’s email issue is devoted to our partners in automation. for our clients on a daily basis. A nod to our incredible partners! 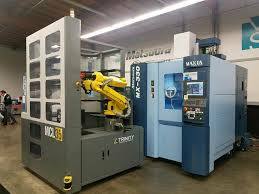 is the process of automating the loading and unloading of industrial machine tools in a manufacturing plant, primarily using robot automation systems. While loading and unloading is the primary function of machine tending systems, the robot will often perform other valuable functions within the automation process. This might include part inspection, blow off, part washing, deburring, sorting, packaging and gauging. In this issue you’ll find a few innovative solutions for machine tending. QC Conveyor, a pallet conveyor for more precise location like Glide-Line or automatic transfer with an autonomous mobile robot. Another aspect of Advanced Manufacturing is post-machining or the finishing of parts: De-burring, Grinding, and Polishing. Once again, Futura Automation has innovative solutions through our component manufacturing partnerships: Applied Robotics for tool compliance and turnkey robot EOAT finishing solutions and OnRobot for force sensing and gripping for smaller and collaborative robots.